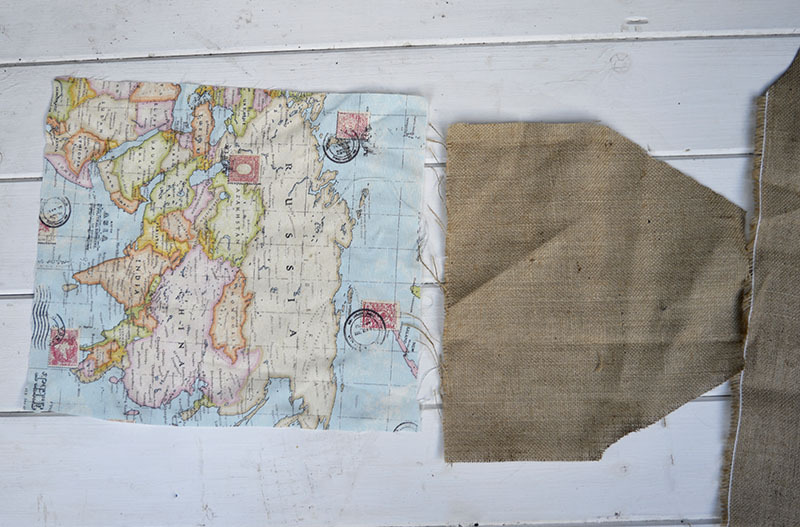 I love maps, traveling and fun crafts that are personal in some way. I decided to put all this together and make these unique luggage tag burlap pillows using map fabric and burlap (hessian). 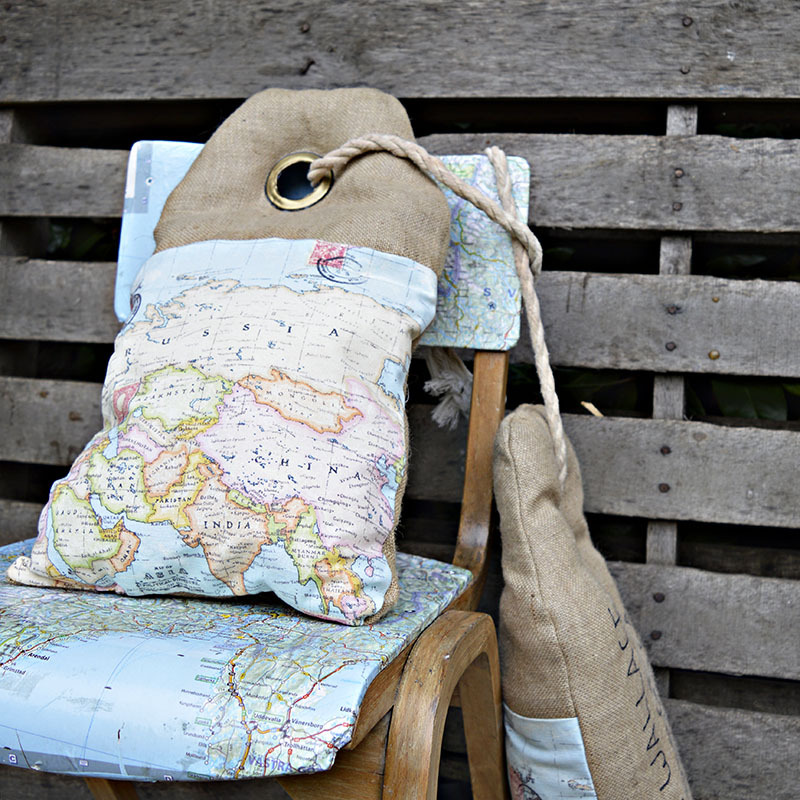 These map pillows have a real vintage vibe. The luggage tags shape give the impression they are definitely from a different era. *My English family and friends give me a blank look whenever I say burlap as they call it hessian. 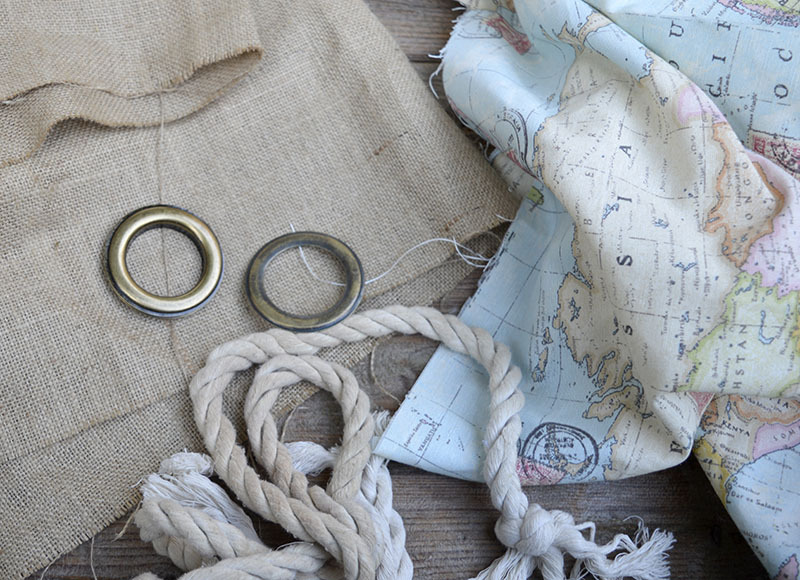 As I follow so many American bloggers and crafters burlap is what I’m used to, plus I prefer the word to hessian. Also, further apologies to my English family and friends but I’m using the word pillow rather than cushion. Actually, the real reason I made these pillows, is that I had some lovely map fabric left over from lining my vintage map suitcase. However, I didn’t have enough scrap fabric to make a whole pillow. 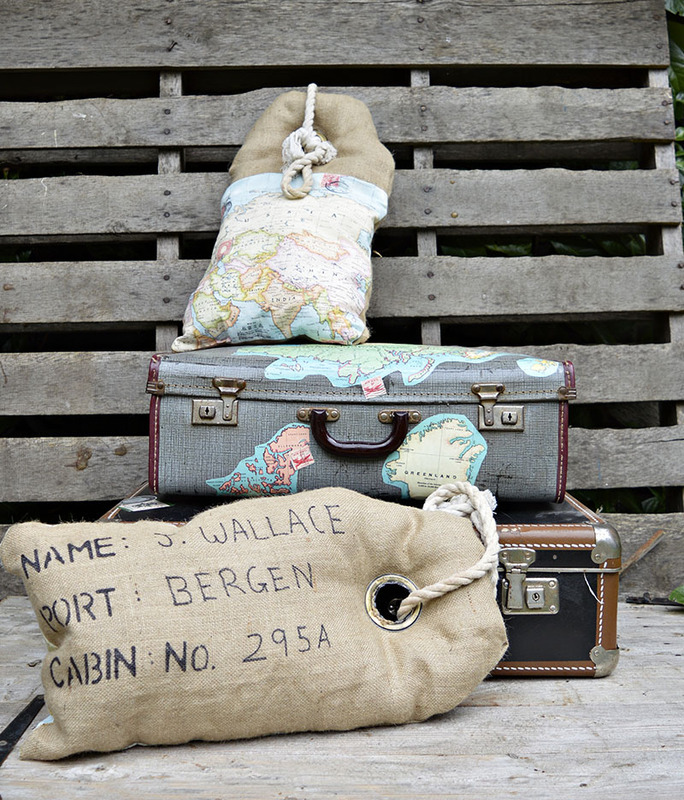 That’s when I came up with the idea of combining it with burlap and making my luggage tag map pillows. 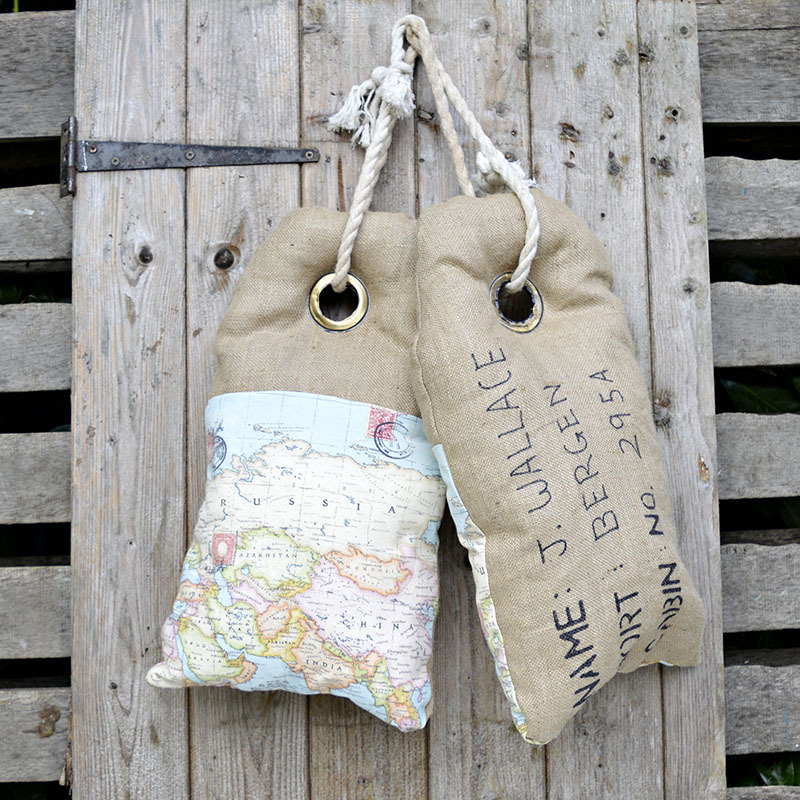 How these map burlap pillows are personalized, is by filling out the luggage tag details. I made one of these as a Christmas gift for my sister-in-law. I personalized the pillow with her name and as my husband’s family is from Norway, I’ve put Bergen as the destination. The other map pillow is for me, so it has my name and Hong Kong as the destination. Hong Kong is my favorite city, as I was born and raised there. My family lived in Hong Kong for 30years. Map fabric– I used no more than a fat quarter for both pillows. Burlap – I used about 1/2 yard of a fine weave burlap. Sewing Machine – optional can be sewn by hand. Firstly you will need to make a template for your pillow. 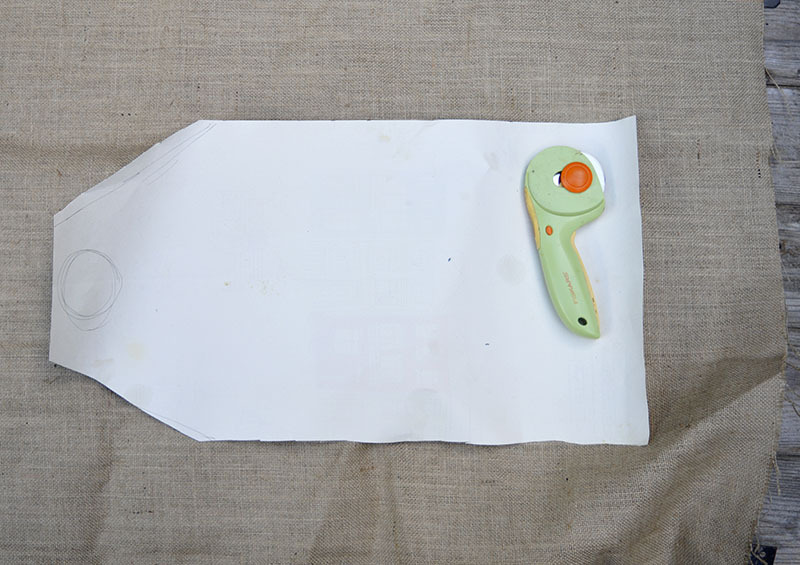 You can make this any size you want, simply draw out a luggage label shape on your scrap paper (or even newspaper) and cut it out. This will be the size and shape of your pillow. Using the template and your rotary cutter cut out the burlap for the tag side. For the other side of the pillow you will cut 2 pieces of fabric. 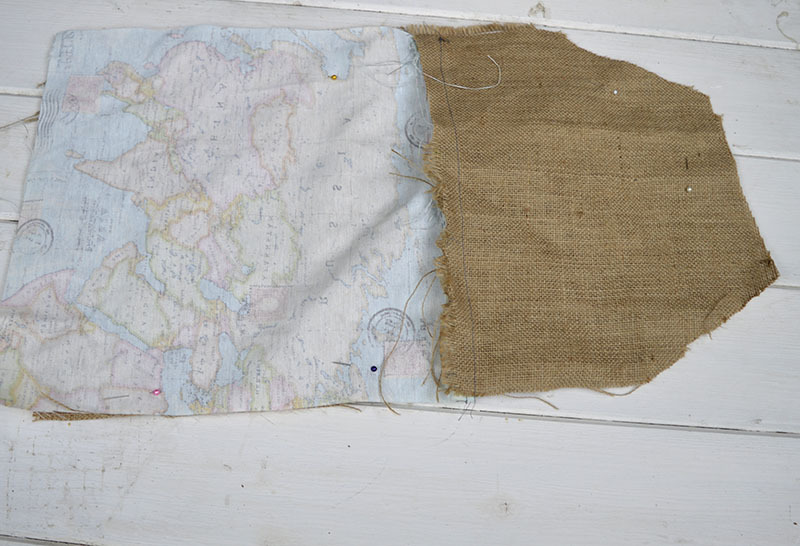 One will be the map fabric and the other piece burlap. Then sew these together to form the map side of the pillow. 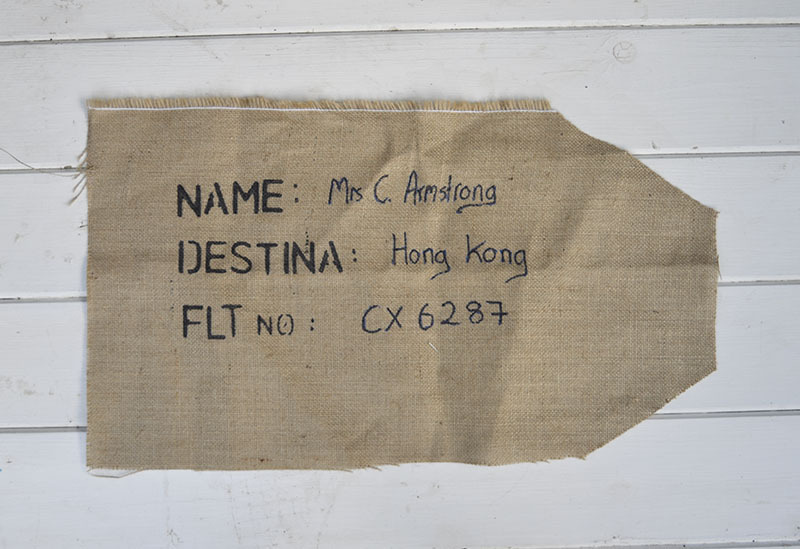 Before sewing the sides of your pillow together, you will want to personalize the luggage label. 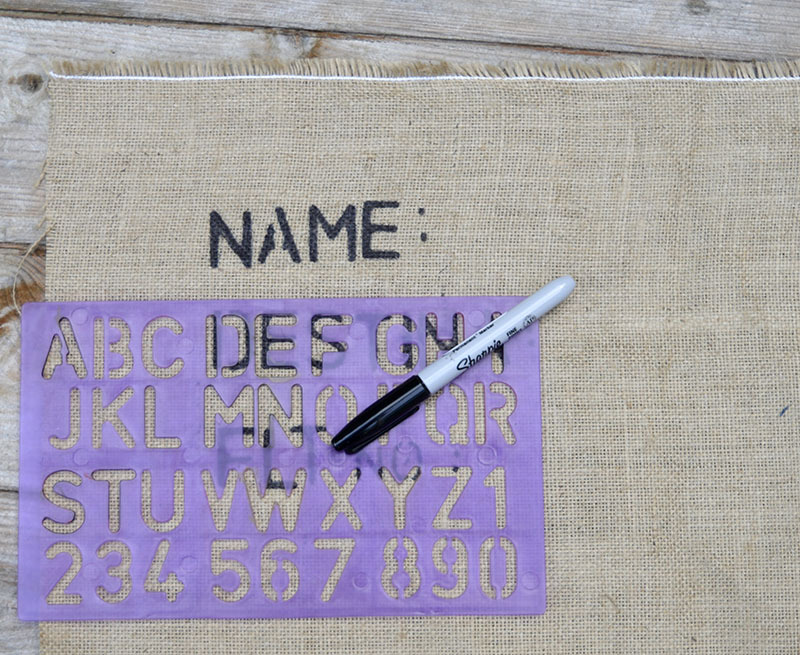 You can do this, by writing on the burlap side with a sharpie and a letter stencil. When you have finished stenciling, then stitch your pillow right sides together. Remember to leave a small gap for stuffing. Then turn your pillow right side out. Now comes the slightly tricky part, inserting the curtain grommet. If you know someone with a grommet machine or have a friendly local sewing shop that will do this bit for you that’s brilliant. If not then you can try fixing the grommet yourself, like I did by using a combination of pliers and a hammer. Place the grommet where you would like your luggage tag hole on the cushion. Mark the spot and cut the fabric to make a hole. The grommet comes in 2 pieces, one for each side. With the help of a hammer and pliers, you should be able to fix the 2 parts together. That is why used metal grommets as they are more malleable. If you are not sure about this part then you can just make a hole and sew round it without the grommet. Now all that is left to do, is to stuff your pillow with fiberfill and stitch up the hole. You can tie some old rope through the hole to complete the luggage tag look. I just love them! Burlap always looks so home grown to me and I can’t wait to try this myself. Just beautiful! Thank you so much. We call burlap hessian in the UK so when I first read American blogs I didn’t know what you were talking about when mentioning burlap. This is so stinkin’ cute! Great DIY. You’re a feature tomorrow at Welcome Home Wednesdays! Congrats! See you at the party tomorrow morning. Thank you very much look forward to seeing them. These are really cute. 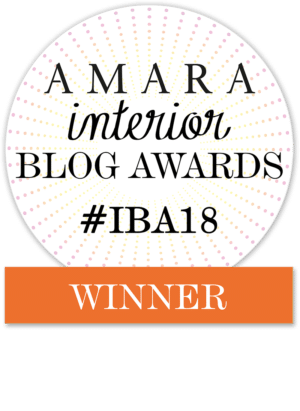 One of my cohosts chose them for their feature on Family Joy Blog Linkup and I decided to visit. Thank you and thanks for the visit. Thank you Toni, maybe the comment got lost in spam that happens sometimes. Adorable project! I like anything that uses burlap 🙂 I am featuring this post at The Crafty Corner link party, which begins tomorrow at 6 am EST. I hope to see you there again. Thank you, I’m really chuffed about the feature look forward to seeing it. Your tutorials are always great! My daughter travels quite a bit and this would be a great gift for her. Thank you for sharing with us this week at Celebrate Your Story, have a great weekend. Thank you, I do think they make for a lovely gift. How neat is that!?! Pinning this one for my next travel! These are adorable! 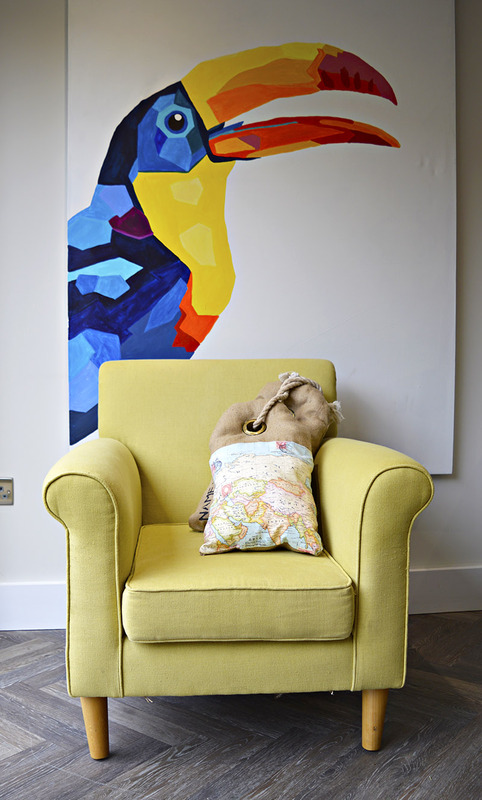 I love maps and this is such a unique map project – perfect for travel naps! This is such a super cute project! Wow, your map material is awesome! Thank you ! Yes you can get some great map material. Super cute, shared on Facebook. Thanks for linking up to the Talk of the Town link party! Thank you and thank you very much for the share. Love your creative idea and I’ve always been map crazy! I was born in England but now live in southern Ontario, Canada. You should be very proud of your unique idea! Thank you. Thank you ! I have only ever visited Alberta and I loved it. Love this one Claire, truly unique and truly you! thanks for sharing on craft schooling sunday, and love the fact that you can hang them up, very handy! Thank you Sara, I do love a map craft. Thanks Naomie, I love maps too ! I’m always looking for new map crafts. Fabulous!!! I am head-over heels. Pinned and can’t wait to try my hand at these. Thank you Diane and good luck with making them. How creative! These are darling! Thanks for giving a tutorial. Thank you. 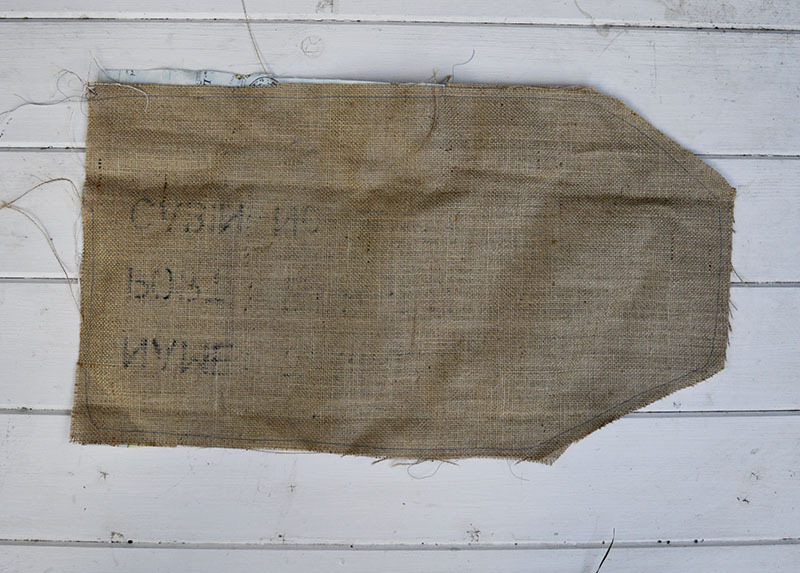 I only found out that the Americans call burlap hessian about a year ago. Claire, this is such a clever idea ~ thanks for sharing @Vintage Charm! I love your name tag pillows. I have never seen anything like that before, absolutely the cutest! What a fun idea! Thanks for sharing on the Pleasures of the NW’s DIY party! These are so cool (do people still say cool?) such a fun way to use those ginormous grommets. Thank you ! I still say cool but the kids say wicked ! What a unique idea! I’m definitely saving this post. Found you via Threading My Way. Thank you very much ! Enjoy making them. Oh my word, Claire that’s so unique and so beautiful. 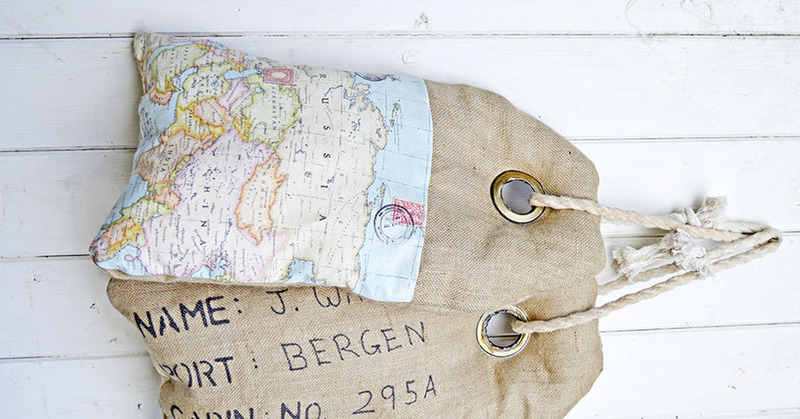 I love how you combined the burlap with the map. I want one!!!! Thank you very much ! Yes they’re great if you don’t have enough of your favourite fabric to make a whole pillow. Such a fun idea, Claire. 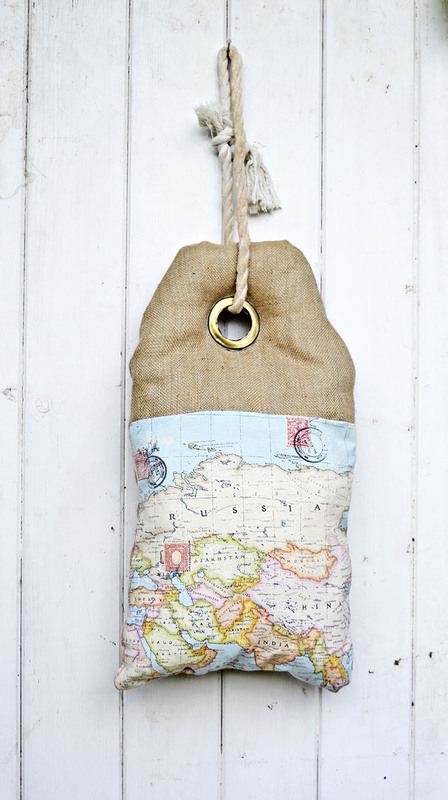 Love the combination of the map fabric and the hessian. I’ve showcased your fab cushions today. Oh my goodness Claire these are absolutely brilliant! I want some! How neat that you were born and raised in Hong Kong. I had an uncle who was a priest for 40 years in Macau. Did you ever venture out there? Thank you! Yes I visited Macau a few times when I was younger. I know you have a Portuguese connection is that your Uncle in Macau. BY the way my parents moved from Hong Kong to Portugal where they now live. 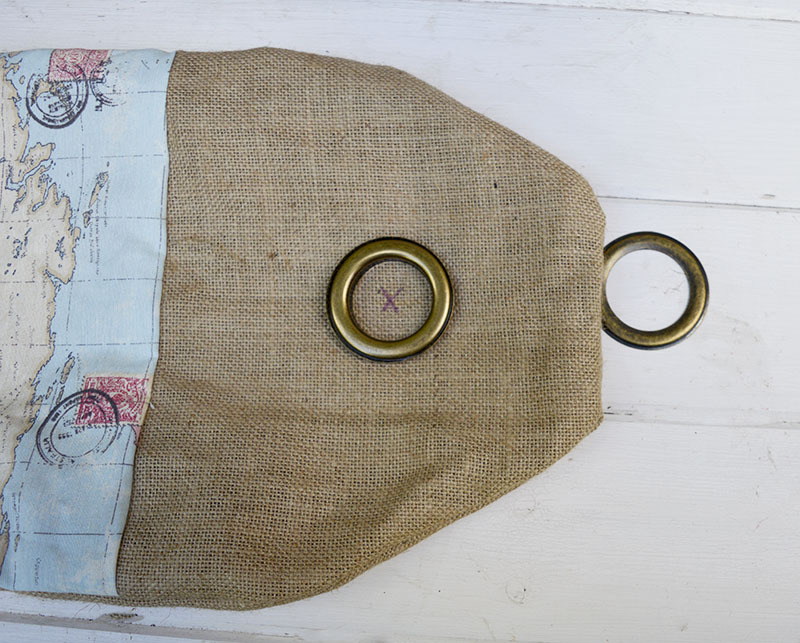 These are so cute- I love anything made from burlap, and you make it look so easy. 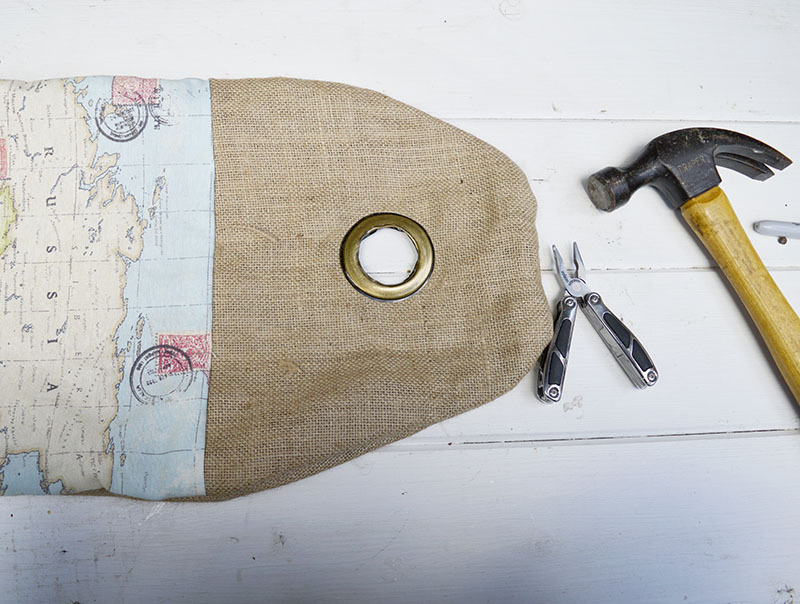 I’m definitely going to have to track down some burlap and try this. Thank you, they are easy. Thank you, yes I’ll be making a few for Christmas. I love burlap! These are so cute! Thank you, a couple of years ago I wouldn’t have known what you meant by burlap as we call it hessian, sackcloth or jute over here in the UK. Super fun idea! Love anything with grommets. Visiting from BOB Tribe. Thanks, yes grommets are my new craft fad. These are really unique pillows. Love them! These pillows are fabulous, Claire! 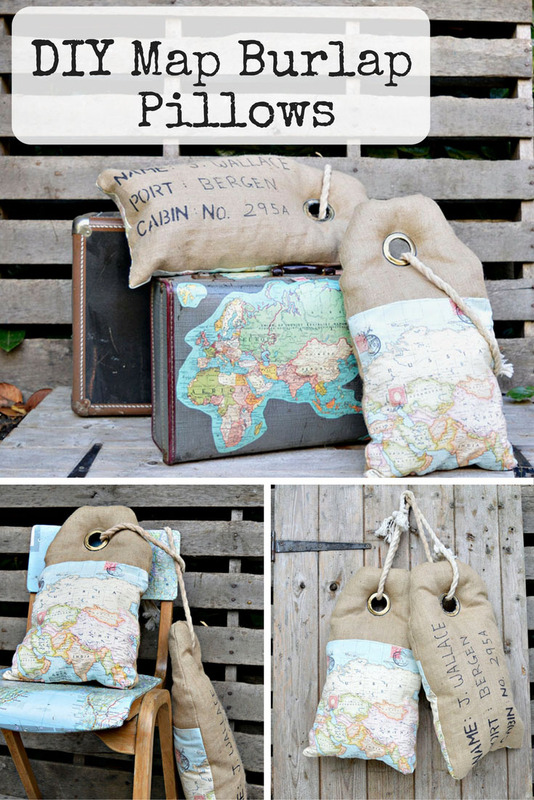 The map fabric and the burlap is a great combination. I also love that you personalized the pillows. Thank you Julia. I love crafts that I can personalise. How creative and clever! Pinning ans sharing. Thank you very much, I can’t resist a map craft. These are too cute. Great tutorial, as well. Thanks for sharing!